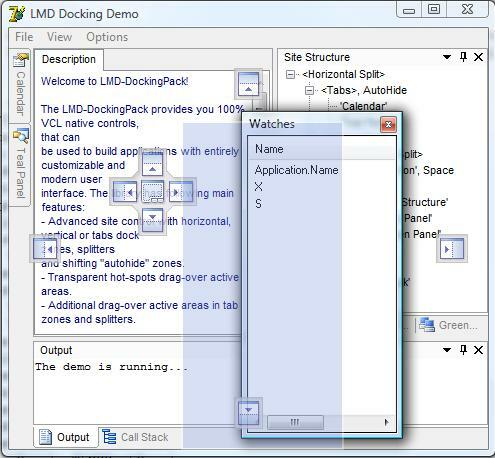 LMD DockingPack is a collection of native VCL components and additional classes that can be compiled into your application royalty free. This package was designed to help you building applications with entirely customizable and modern user interface. Add docking features with floating panels as known e.g. from Visual Studio (2005, 2010 or even the new Metropolis style in VS 2012)! A full featured DockingPack Visual Theme editor was added (created with IDE-Tools controls). It is possible now to design custom docking themes for any possible use case (most theme/style engines don't support all required elements/parts for advanced visual docking appearance). DockingPack can now be adapted to any visual design, regardless of used style/theme engine! All built in styles (including Visual Studio 2012 Blue and Dark Themes) are included in editable formats.